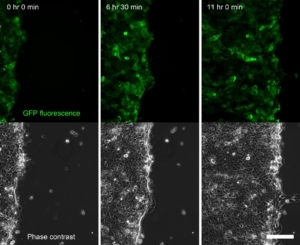 NEW GENERATION LEDs The pE-4000 sets the standard as the universal illumination system for fluorescence microscopy. The system has 16 selectable LED wavelengths across 4 channels that can be matched to the filters and fluorophores of almost any microscope, making it the broadest spectrum of illumination available. 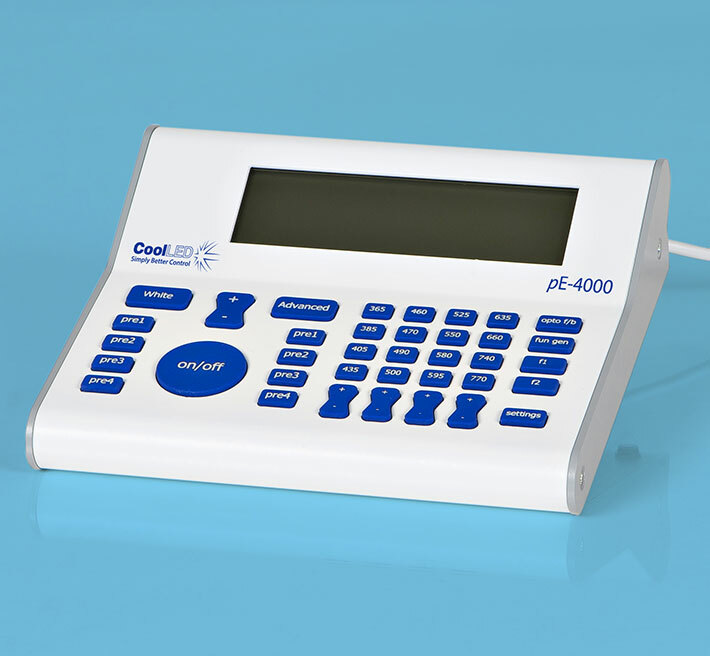 The CoolLED pE-4000 now benefits from our award winning sustainable Greentechnology and delivers enhanced intensity at your microscope sample plane with a significant reduction in energy consumption, and is supplied with a 3 year warranty after registration. 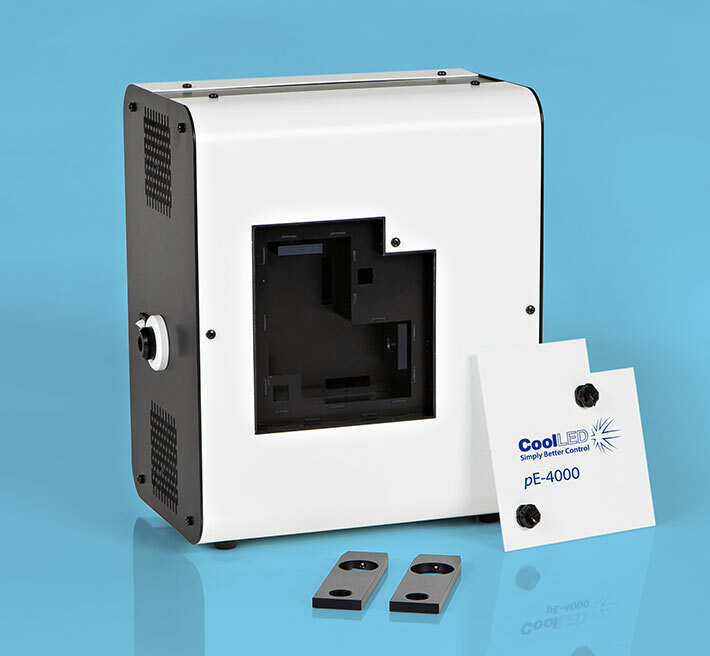 As the first company to introduce LEDs into fluorescence microscopy, CoolLED has developed a comprehensive understanding of the complexities of configuring and selecting filter sets for samples which have multiple stains. 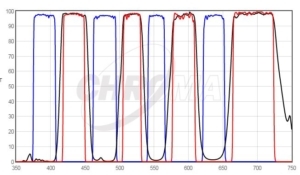 These ’multi-band’ filters must have a corresponding absorption and emission band for each stain and the bands must be kept spectrally separate to ensure there is no overlap. 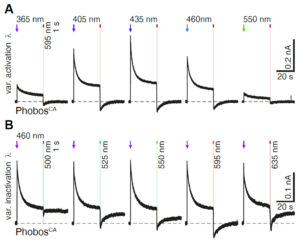 DAPI/FITC/TRITC/Cy5 Quad filter excited by pE-4000 at matched wavelengths shown above. 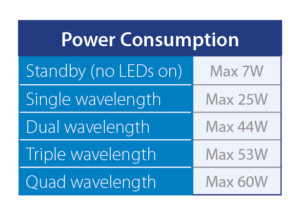 CoolLED’s innovation comes from recognizing that all the stains used in multi-band work can have their absorption bands divided into four separate groups across the spectrum due to the restricted bandwidth available. 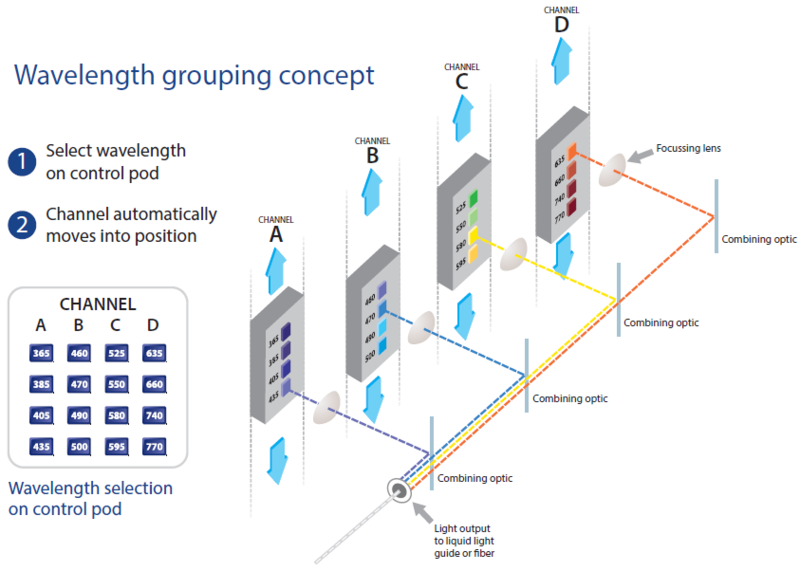 This has allowed the development of a patent-pending, wavelength-grouping concept which makes it possible to deliver more power in an efficient four channel system. 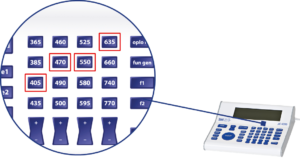 With its unique 16 selectable LED wavelengths, the pE-4000 ensures optimum compatibility with all single and multi-band filter sets. The flexibility and extensive functionality of the pE-4000 broadens the range of illumination options in core facilities. 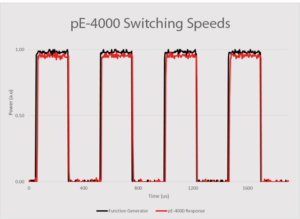 The pE-4000 allows multiple experiments with varying wavelengths on the same sample , as shown here. 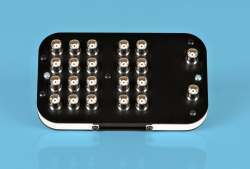 The compact pE-4000 Light Source houses all the LEDs, their combining optics, thermal management and control electronics. 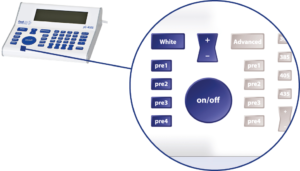 A dual mode control pod gives manual control in either White or Advanced modes. 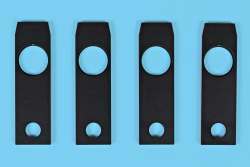 Light is delivered to the microscope by either a single liquid light guide (LLG) or fiber. 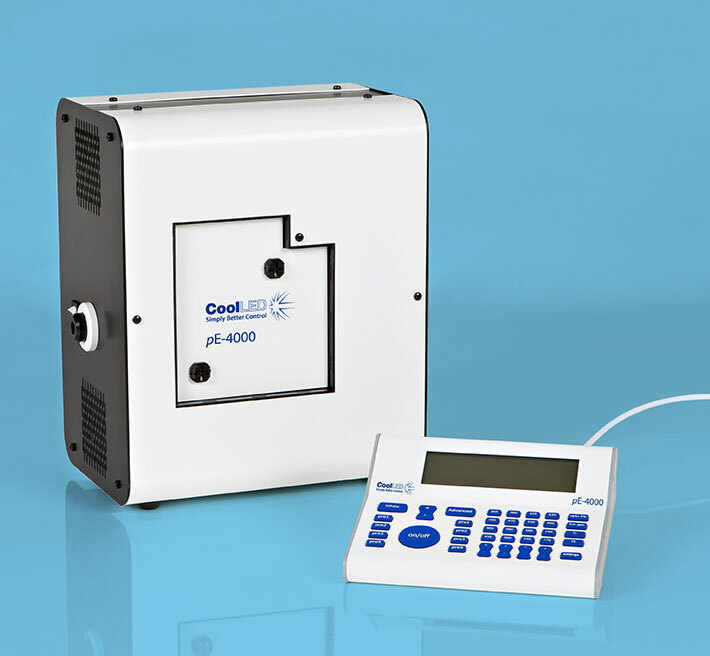 LLGs can be used in conjunction with CoolLED’s pE-Universal Collimator which can accept a microscope adaptor from CoolLED’s extensive range.